Doe license applications are soon being accepted in Pennsylvania. Doe license applications are due soon for those wanting to hunt in Pennsylvania this fall. No one would mine coal if they had to leave all of the ore underground, right? It should be the same with data. That’s the opinion of Eric Richey anyway. Founder and CEO of Sovereign Sportsman Solutions, a Nashville, Tenn.-based technology company, he said data mining is only effective if people are able to use the information collected to solve problems. That’s especially t rue when it comes to state fish and wildlife agencies selling licenses to anglers, hunters and trappers. “That has been the Achilles heel of this industry for the last 15 years. You have these systems that have an enormous amount of data inside of them and you have a complete and total lack of ability to get to that information,” Richey said. He’s going to try and fix that in Pennsylvania. Sovereign Sportsman Solutions, known as S3, is going to take over as the new vendor selling licenses for the Pennsylvania Game and Fish and Boat commissions. S3 has already developed automated license sales systems in other states. In fact, it’s signed more contracts with state agencies in the last eight years than all of its competitors combined, Richey said. The process of choosing S3 took about 18 months, said Brian Barner, deputy executive director of the Fish and Boat Commission. Contracts were signed in February. There’s a long way to go to get the system ready, however. S3 won’t take over until February or March of next year, said Dot Derr, director of the Game Commission’s bureau of administrative services. “That seems to be the perfect time for both the Game Commission and the Fish and Boat Commission. And so we have a very small window. It’s very important we stay on track,” she said. Indeed, there remains a lot to get done between now and then. The commissions and S3 are determining what capabilities they want the new system to have. Right now, for example, the Game Commission allows hunters to report deer and turkey harvests online, by phone or using printed postcards. The phone system is going away, though, Derr said. And if the S3 system can be configured to allow hunters without a home computer to file reports by returning to the store where they bought their license, postcards will likely disappear next, she added. That might require some extra negotiations, though. Derr said vendors, who collect a fee for selling licenses, may want paid to accept harvest reports, too. Those talks are yet to occur, she said. Sportsmen, meanwhile, will see benefits of the new system, Richey said. One big one is that the system will be based entirely online. What that means is customers, i.e. hunters, angler and trappers, will have their own accounts, complete with their own usernames and passwords. That will better protect customer identification numbers, or CIDs, and attached birthdays and Social Security information, Richey said. The commissions will benefit, too. For one thing, they’ll be able to sell merchandise – books, posters, patches and more – through the system. The Fish and Boat Commission may also be able to register boats through the system. The commissions can do targeted marketing, as well. That might mean getting information to hunters in one particular region, Derr said, or making sportsmen aware of some kind of activity or event close to their home. The biggest benefit to the commissions, though, will be their newfound ability to figure out who its customers are, which ones are coming and going, what they’re most interested in and what it will take to keep them buying licenses, said John Arway, executive director of the Fish and Boat Commission. Those are things the commissions – and their counterparts around the country – have been talking about for years. “This new system will be the engine to move forward with a lot of the ideas we’ve all been talking about but never been able to implement because we’ve been stuck with an old platform,” he said. County treasurers will accept doe license applications from Pennsylvania residents as of Monday, July 9. Non-residents can apply for antlerless licenses starting on July 16. 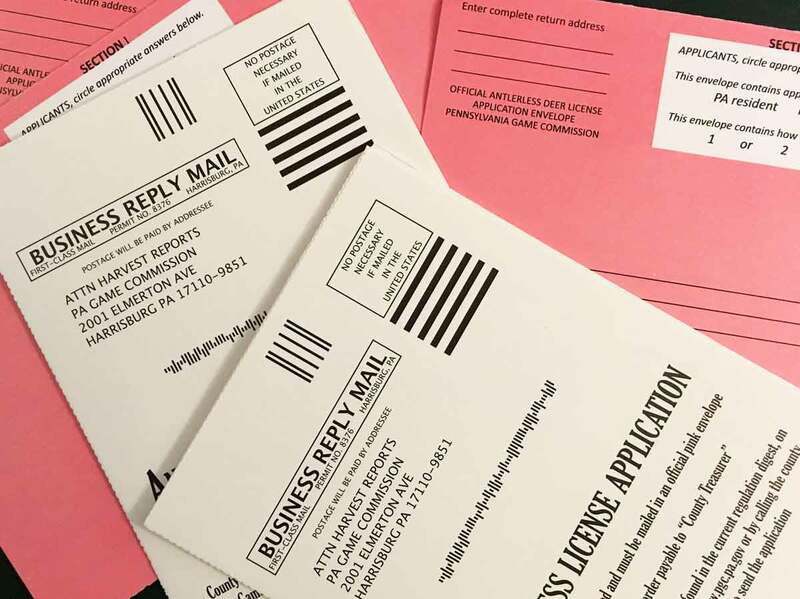 First-round unsold antlerless licenses go on sale via mail, for residents and nonresidents, starting Aug. 6. Second round licenses go on sale Aug. 20. Over the counter sales for licenses in wildlife management units 2B, 5C and 5D start on Aug. 27. In all other units, over the counter sales begin Oct. 1. Hunters will notice a few minor changes to the familiar pink doe envelopes used to apply for tags. For starters, the box where hunters describe whether they’re residents or not, and tell how many applications – one, two or three – has moved to the top front center of the envelopes. Most notably, the envelope seals with a self-adhesive strip. There’s no more licking those gluey squares and then taping things shut anyway. Prices for doe tags remain the same. They’re $6.90 for residents, $26,90 for non-residents. Game Commissioners allocated slightly more doe tags for this year than last, based on several factors. In most parts of the state, hunters can purchase a total of three antlerless licenses. However, in wildlife management units 2B, 5C and 5D, there is no limit. Each hunter may apply for only one license per round in those WMUs until Aug. 6, however, when an unlimited number of applications can be submitted.